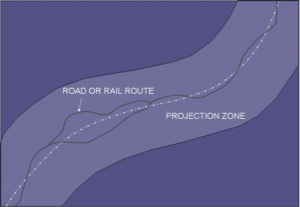 SnakeGrid provides a single continuous near-zero distortion grid coordinate system for projects such as railways or pipelines that extend for hundreds of kilometres. Along the whole length of the route, we aim to keep scale factor distortion less than 20 parts per million, no matter how the height changes, and this will hold for several kilometres on either side. This low level of distortion is generally less than the practical survey accuracy, and so in effect the grid can be considered as distortion-free. We do this by developing a set of algorithms that projects the curved surface of the Earth in such a way that the line of true scale follows a generalised trend line through the project. It doesn’t follow every twist and turn of the route, but establishes a smooth sinuous corridor where the scale factor is close to 1. Similarly, in height, the line of true scale doesn’t follow every lump and bump but gives true scale along the generalised trend of the profile. Here’s an example of the distortion for Phase 1 of the HS2 project, for example, showing the broad corridor along the route and for a broad swathe on each side where the distortion is less than 20 ppm at the ground height. There is a generic SnakeGrid algorithm, but the particular characteristic of every project is captured by creating a SnakeGrid parameter file. 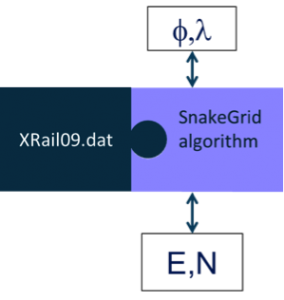 For example, the grid that has been created for London’s Crossrail project is call XRail09, and the parameter file is called Snakeparams_XRail09.dat. When the algorithm is fitted together with the relevant parameter file, coordinates may be freely converted between grid and geographic (latitude/longitude on the ellipsoid). So this is what commissioning a SnakeGrid means – we create for you a parameter file, which you can use in conjunction with any software that has the SnakeGrid algorithms in it. You may not necessarily be interested in geographic coordinates, but these can in turn be converted to other systems, such as national or State Plane coordinates.